Hello. My name is Steve Krause, and I am the person responsible for this site. I am a Ph.D. student in German Literature at the University of Wisconsin, Madison. In May, 1997 I graduated Phi Beta Kappa from Pomona College in Claremont, CA with a B.A. in Mathematics and German, and in May of 1998 I finished my M.A. here in Madison. On June 15, 2001 I passed my preliminary exams and became a dissertator. 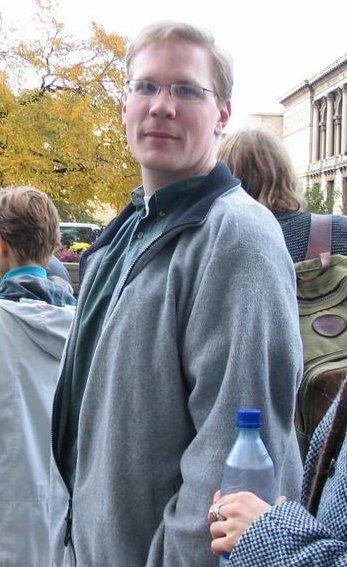 I am spent the 2005–2006 academic year in Berlin, Germany, on a Fulbright Fellowship, and in the fall of 2006 I am teaching 5th-semester German at the University of Wisconsin-Madison. Although I have spent many years in Madison, Wisconsin, I grew up near Meridian, Idaho, an old farming community that has become a suburb of Boise over the past decade or two. I am originally from Pendleton, Oregon, a small city in eastern Oregon. My interests are rather diverse, and the contents of my web site reflect this diversity. In addition to math and German Literature I enjoy: geology, physics, art, reading, writing, (composing, listening to, and performing) music, cooking and baking, traveling, playing games (such as bridge), and spending time with my friends. I spent my junior year of college in Europe: I studied during the fall semester of 1995 in Budapest, Hungary with the Budapest Semesters in Mathematics program. During the spring 1996 semester I studied in Marburg, Germany at Philipps Universität. In addition, I spent my junior year of high school as a Rotary International Exchange student in Gifhorn, Germany. I have begun to collect information about my family history. As I find the time, I will post genealogical information at this site. My immediate family lives in Idaho, but a great deal more resides in Oregon, and I also have relatives in the Midwest, California, and—naturally—those still in Europe (so far removed that I've never met them). A “large” set of general photos of me—from “the beginning” until “now”—can be found on a separate page.